Sergei Skripal poisoned himself by accident on March 4, 2018, in the centre of Salisbury. At the time he was engaged in an operation, freelance or official, which was known to the British intelligence agency MI6. The two Russians, Anatoly Chepiga and Alexander Mishkin, who visited Salisbury on March 3 and during Skripal’s fateful afternoon, were a signal from the Russian military intelligence agency GRU that the Russians knew in advance what Skripal was doing, and wanted the British to know they knew. The two Russians never made it to the front door of the Skripal house in Salisbury; the door-handle wasn’t poisoned; there was no contact between Skripal, Chepiga, Mishkin. Their affair had nothing to do with the subsequent death of Dawn Sturgess after she was poisoned at her companion’s home in Amesbury, near Salisbury, on June 30. By British legal standards of proof beyond reasonable doubt or the balance of probabilities, there is no case to answer of either attempted murder or chemical warfare. There is another, more ancient standard for coming to this conclusion. 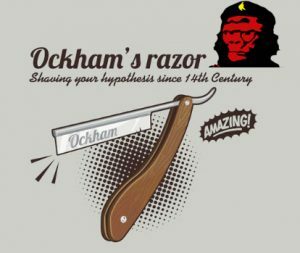 In the mid-14th century William of Ockham, an English born and Oxford educated cleric, promulgated the maxim that deduction from multiple and competing hypotheses should be made as simple as necessary. His idea has been called, metaphorically, Ockham’s razor. Strop the razor on this dossier, and then try the razor on the Skripal case for yourself. For the discussion with Chris Cook, listen to today’s Gorilla Radio broadcast from Victoria, British Columbia, starting at Minute 35:46.